Up front, I want to say that I don't have a boat. I've never had a boat. And I don't intend to ever have a boat. I'm not a boat guy. But a lot of people are. Maybe you are. If you are, maybe you'll want to play along. And, even if you aren't, maybe you'll want to play along, too. Because fun is fun. Some people are kinda clever when it comes to naming a boat. And, since it was a Saturday, and I didn't feel like getting out of the recliner, I pulled up The Facebook and started seeing what kinda nonsense people I know or are friends with and have never met are getting themselves into. And that's how I ran across a list of 37 interesting boat names. And, since it was The Facebook, there were only 25 on the list I clicked through to. If math and spelling were a requirement, there would be no one on The Facebook. Anyway, some of the boat names were kinda clever. Okay, some were kinda lame. But some were funny. But I think y'all can do better. 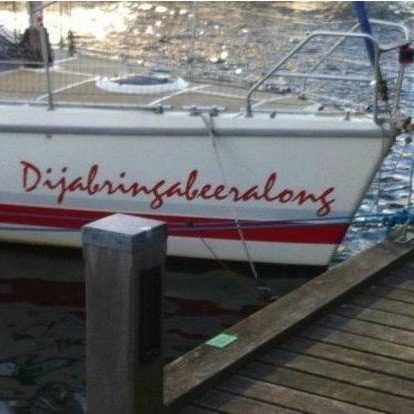 If you've had a fun or funny name on a boat, how about sharing it with us. Or, if you have an idea for a great boat name, share that. Could be fun. In an episode of the Flintstones Fred and Barney won a boat. Fred wanted to call it the Nautilus. Barney wanted to call it the Sea Queen. They comprised and called it "Nausea". I know it's a cartoon but I thought it was funny. I knew a salesman who had a sailboat he named, "Sale bad the Sinner." when the CG complained that it was foul language the owner responded that it was a small town in NJ and they approved it. My brother heard a boat named "Dock Wrecker" calling for a mooring. Not sure if they were answered. When people name their boat, they should consider the fact that during any emergency call, the U.S. Coast Guard hail them by name 3 times. I once heard a distress call from a vessel named "Wet Dreams". I am quite sure that the least senior person at the Coast Guard station had to answer that call. "Hook, Line and Sink Her"
"My Other Boat Has Red Lips"
My dad was a big boat guy, but far from rich. Our boat was the Dun Brok Us. 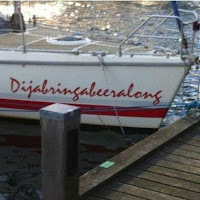 "Didjabringabeeralong" - name of a town in Terry Pratchett's Australia-themed fantasy novel "The Last Continent". My favorite was a sailboat named Nirvana. I often wondered whether the owners knew that Nirvana can be translated literally to "a state of no wind". Once upon a time, my mom, dad and little sister flew to Long Beach, CA to visit me. I took them to a sea-food restaurant called The Rusty Pelican near the marina. As we approached the restaurant, my dad asked, "What did you say the name of this place was? The Crippled Penguin?" That night I vowed that if I ever owned a boat, I'd call it "The Crippled Penguin"! I know a guy, a banker; his fishing boat is called "Conference Call." An old family friend had a series of ever bigger boats named "The Nice Wife I", "The Nice Wife II", etc. up at least through IV or V. Not a reflection of reality but still a great name.